This sign should be used to ensure Restricted Area Compliance with the ITAR Sign Restricted Area to be used to denote restricted access for work centers. Manufactured specially for CVG Strategy, our 3M customized 10×14″ Aluminum “ITAR Sign Restricted Area” will last years and is suitable for indoor or outdoor applications. 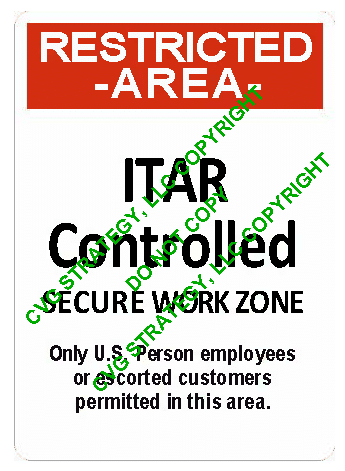 This”ITAR Sign Restricted Area” has four holes for mounting on a wall or pole above and below text. The “ITAR Sign Restricted Area” is chemical resistant, high temperature resistant up to 168F and have an outdoor life expected at 10 years or more. This “ITAR Sign Restricted Area” is used at many commercial facilities in the United States and are very necessary to warn visitors that the company is committed to ITAR Compliance and in controlling access to its buildings and operations.